Workers’ Compensation Claims Slip And Fall Accidents At Work: Do You Have A Valid Claim? Need legal help to file a workers’ compensation claim in Los Angeles or elsewhere in California? Workers’ compensation attorneys in California explain that if your injury or illness occurred as a direct result of the employment relationship between you and your employer, you may have a valid claim. Home > Blog > Workers’ Compensation Claims Slip And Fall Accidents At Work: Do You Have A Valid Claim? On behalf of Koszdin, Fields, Sherry & Katz posted in Workers Compensation on Wednesday, April 11, 2018. Slip and fall accidents account for a staggering more than 20 percent of all workers’ compensation claims in California and all across the United States. There are also trip and fall accidents that result in on-the-job injuries, and even if a worker is injured due to a fall alone, he or she may be entitled to claim workers’ comp benefits. While construction workers are more likely to get injured at work in slip and fall accidents or due to falls, even office workers can sustain injuries in slip and fall or trip and fall accidents at work (when, for example, your sleepyhead coworker spills coffee on the slippery floor, or someone puts a defective printer on the floor just outside of his cubicle, turning it into a tripping hazard). There is a common misconception in Los Angeles and elsewhere in California that if a slip and fall accident at work is caused by your own inattentiveness or carelessness, you will NOT get workers’ compensation benefits to cover your injuries and damages. Well, that is not true. Whether or not you can claim workers’ compensation benefits after a slip and fall or trip and fall accident, which occurred due to your own fault in the course of employment, depends on the circumstances of your case. That is why it is highly recommended to speak to a Los Angeles workers’ compensation attorney to find out whether you are entitled to receive such benefits as permanent or temporary disability benefits, medical care, job displacement benefits, loss of wages, and many more. Since workers’ compensation in California is basically a “not fault” system, you may be able to receive workers’ comp benefits even if a slip and fall accident was your own fault. Therefore, our Los Angeles workers’ compensation lawyer at the Koszdin, Fields, Sherry & Katz law firm explains, your claim will most likely be considered valid even if you were to blame for causing the slip and fall or trip and fall accident that left you injured but only as long as the accident took place while performing your job duties. Many workers in Los Angeles and all across California tend to think that they will have to prove negligence or carelessness on the part of their employer in order to obtain workers’ compensation benefits after a slip and fall accident, but that is not true. As a matter of fact, an injury that occurred in the course of employment will most likely be considered “work-related” and it even does not necessarily have to occur in the workplace. Our best workers’ compensation attorneys in California explain that if your injury or illness occurred as a direct result of the employment relationship between you and your employer, you may have a valid claim. 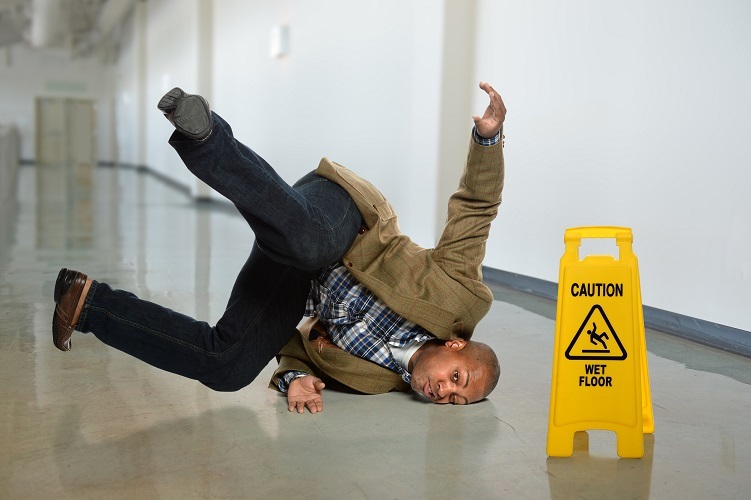 What about slip and fall accidents outside of the workplace? That means that even if your on-the-job injury was caused fully or because of your own negligence, carelessness or inattentiveness, your injury would not be disqualified from workers’ compensation benefits in California. However, you would still face a heavy burden of proof to establish a direct connection between your activity at the time of injury and the employment relationship. For that reason, you will need a workers’ compensation attorney in Los Angeles, who will help you maximize your chances of success and obtain compensation on your behalf. Keep in mind that you if you slipped and fell while commuting to or from work, you will most likely not be entitled to workers’ comp benefits unless the accident occurred on the parking lot or any other premises that is considered to be your employer’s premises. Also, if your slip and fall injury occurred when you were running a work-related errand for your employer outside of the workplace, you may be able to recover damages. The same goes for injuries that occur on business trips, as they are considered work-related. However, if you were injured while on a lunch break, you will most likely not be able to receive workers’ comp benefits. Need legal help to file a workers’ compensation claim in Los Angeles or elsewhere in California? Contact our attorneys at the Koszdin, Fields, Sherry & Katz law firm to speak about your particular case and get a free consultation today. Call our offices at 818-812-5639 or (toll free) 800-747-3447 or complete this contact form. Do I Still Get Workers Comp If I Fail a Drug Test?